Saint Hoax is a pseudonymous artist, activist and sociopolitical critique who manipulates popular culture references to satirize contemporary society and politics. He describes his work as being ‘POPlitically incorrect’ as he does not shy away from exposing the grim underbelly of contemporary politics through humorous references to popular culture. His anonymity enables him to be openly provocative and ensures that the attention remains on the art rather than on the artist. 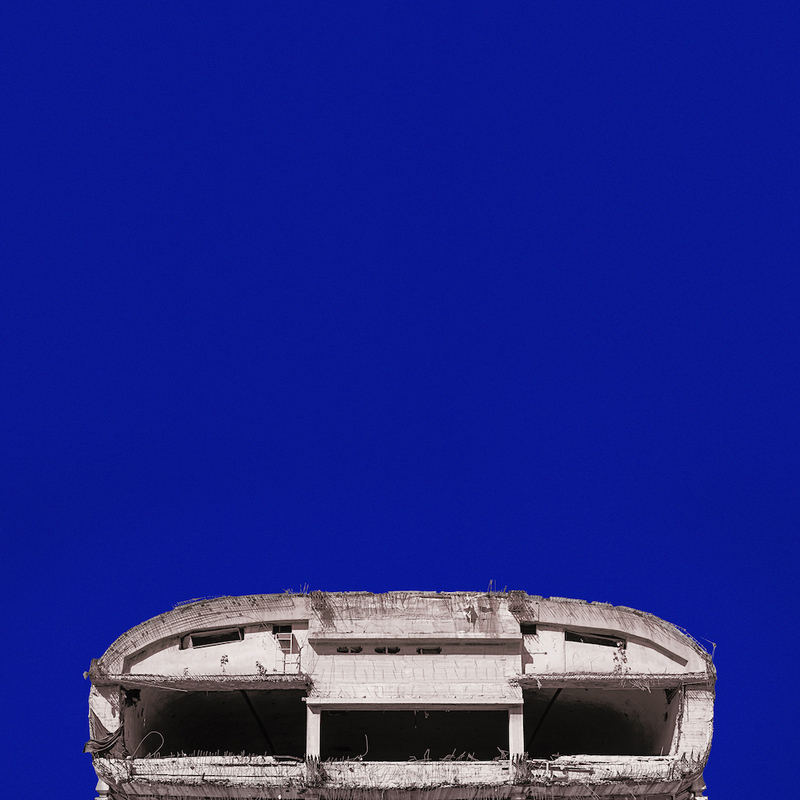 His upcoming exhibition MonuMental, organised by Plastik Gallery, will take place in Beirut’s iconic monument dubbed ‘The Egg’, an emblematic relic of the Lebanese civil war, which will open to the public for the first time in 10 years for this exhibition. The artist’s pseudonym is a paradoxical play between the Saint, a figure typically associated with purity, and the hoax, a term synonymous with deception. 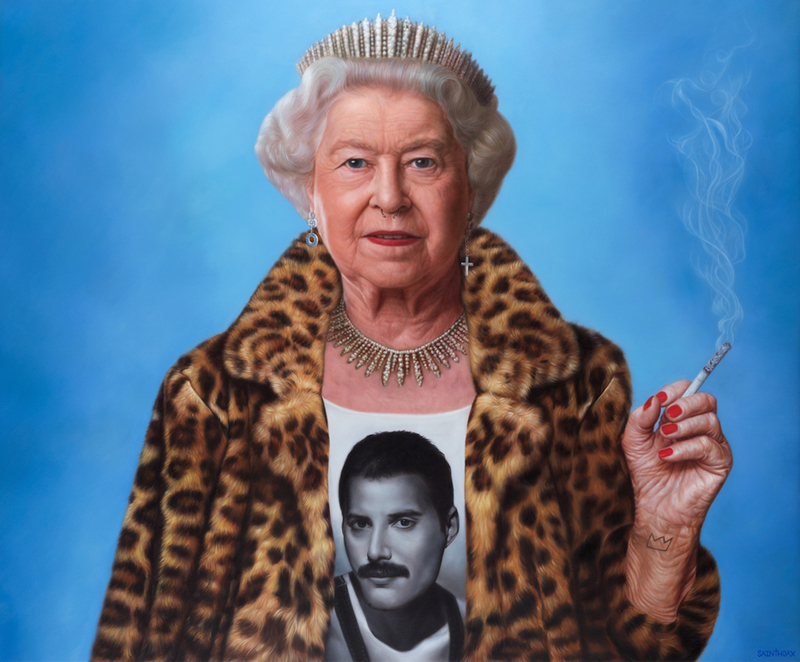 The artist claims that this very juxtaposition is reflected in his work, as he deceptively manipulates images of revered icons to evoke uncomfortable truths about contemporary society. MonuMental, Saint Hoax’s third solo-exhibition, is concerned with exactly this, with dismantling the brilliant facade of celebrity culture to reveal the inconsistencies that lie below. The title of the exhibition is a play on words hinting at the pathos that lurks beneath the shiny veneer of popular iconography. As a celebrity’s fame grows exponentially, so does the rift between these two spheres, between the inner and the outer, the shiny veneer and the murky pathos. 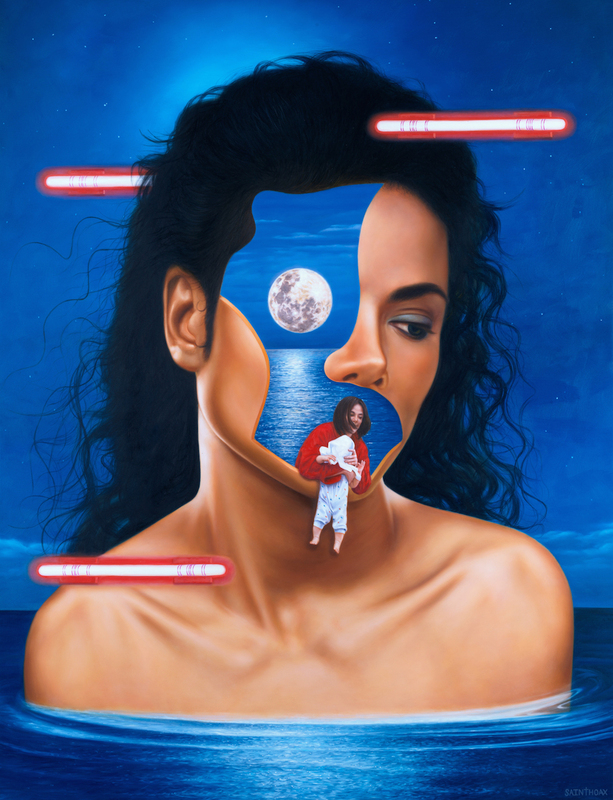 The exaggerated proportions of the works on display at MonuMental are designed to magnify this rift, by highlighting the inconsistencies between the icon’s over-inflated public image and the inner vulnerabilities of the person behind it. Incidentally, the exhibition is being held in ‘The Egg’, Beirut’s iconic structure that was terribly destroyed during the civil war. Despite its poor physical state, it is still revered as a landmark building that stands robustly in the centre of Beirut, much like Saint Hoax’s popular icons who appear to be standing strong even though they may be crumbling inside. The title piece of the show is an instillation inspired by one of the most infamous public figures of the current moment. It consisted of an inflatable Trump-shaped tank that roamed the streets of Beirut in the lead up to the exhibition. This was a satirical instillation, aimed to highlight the absurdity of Trump’s political persona that is at once entertaining, for those who can afford to laugh, and terrifying, particularly for those whose lives are at risk under his leadership, like a balloon that could explode at any moment, forever flattening what once stood strong. It is true to say that the iconography used by Saint Hoax is coming mainly from the West, in the likes of Trump, to the Queen of England, to Disney to Breakfast at Tiffany’s. 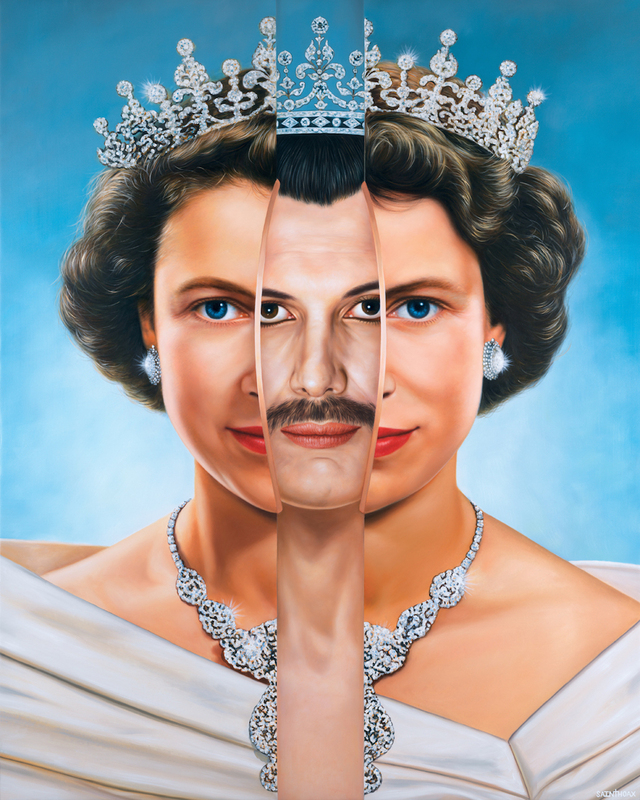 The artist claims that this does not stem from a fascination with the West but with the way in which Western pop culture has devoured most of the globe. It is a commentary on the ubiquity of Western popular culture which is imposed on the rest of the world through the dominance of Hollywood and the global reach of the media. In such a way, associated iconographies have become common to everyone, almost acting as a unifying force and constituting a collective identity that so many people the world-over can relate to. Saint Hoax takes elements of this collective culture and distorts them slightly, probing us to think twice about contemporary iconography that we wouldn’t usually question. 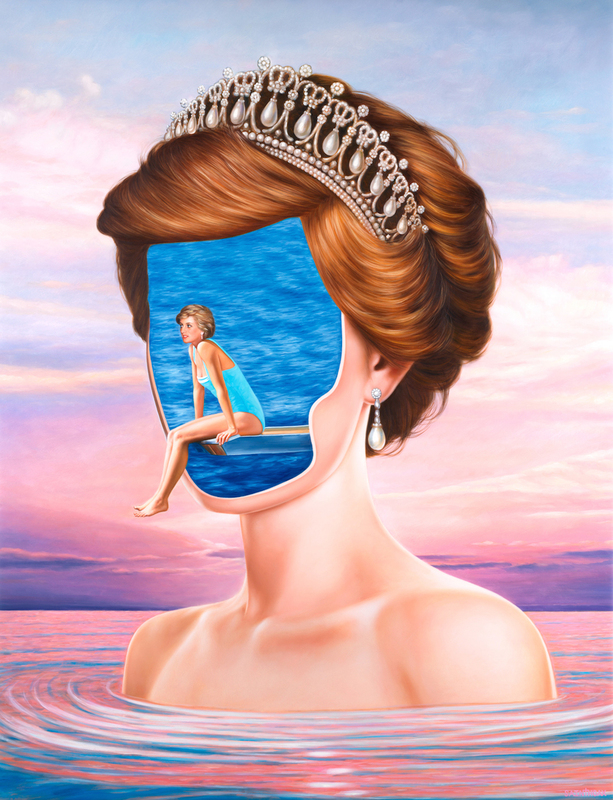 From giving Disney princesses black eyes to serving the Queen of England a McDonald’s meal, Saint Hoax attempts to undo cultural norms through his paintings in the hopes to trigger a reaction from the viewer, and a reflection on contemporary society.